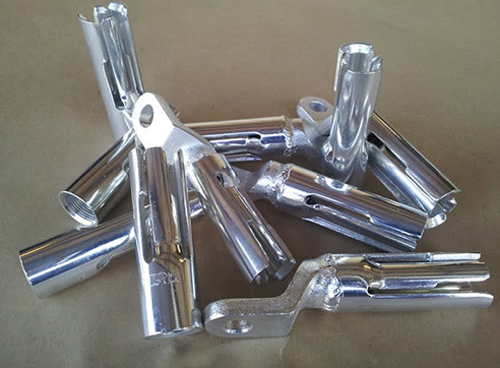 At Commercial Electro Plating, we offer a Tin plating service for steel, brass, and copper parts that require a finish with good corrosion resistance and excellent solderability. Tin is a useful metal for the food processing industry since it is non-toxic, ductile, and corrosion resistant, and is also widely used for parts in the electronics industry. Our modern facility houses electroplating plating lines with capacities up to 44“ x 16" x 27" for parts weighting up to 200 lbs. We employ various quality measures which include constant monitoring and analysis of our baths for proper chemistry. This allows us to meet ASTM 545-92, Class A-E requirements for .0001" to .001" thick coatings, and Mil-spec MIL-T- 10727A for minimum coating thicknesses of .0003". Offering unmatched quality our Tin plating service can be executed with lead times as short as two to three days, and is suitable for parts such as stampings, castings, fasteners, and electrical contacts. We handle quantities from prototype to large scale production runs, and offer special packaging services to help you meet your production needs. For more information, please contact Commercial Electro Plating today.